It was a beau tiful September morning three years ago when my sweet husband asked me how I would like to spend my birthday. 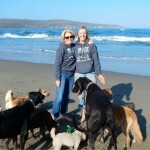 That was easy, I wanted to start with a walk on Dillon (off leash) beach with our two dogs. As it happens so often in life, I had no idea that decision was going to slowly change my life for the better. It was most likely Tyra, the gigantic black Great Dane that started the conversation that morning with Shirley and Paul. I instantly liked this woman! Was it her bubbly, fun, easy-going personality that popped out, was it that I discovered within minutes that we both love dogs and horses, and rescues and fosters, and that we lived walking distance for 12 years and never met each other during that time? That we both raised a son and a daughter that went to the same schools, or that I used to be a flight attendant and Paul is a pilot? That their son, Scott was trying to get on as a fire fighter, and my husband George, had just retired from the Fire Department? Maybe it was all the smiling, laughing and talking we crammed in to those few minutes. As we went to continue on our way, Shirley ca lled out, “friend me on facebook”! And Paul made a little joke about her 400 fb friends! That evening I did friend her on facebook. And not too long after that it turned into a “real” friendship. A friendship you can’t thoroughly describe, but that you can only feel with your heart. Shirley and I have stayed up a few nights watching homeless mommy dogs deliver their unwanted puppies. We have kissed those puppies daily, played with them over glasses of wine, and watched them go off to their new loving homes. All the while we were developing a strong bond as we got to really know each other. We shared stories, secrets, hopes, dreams and heartaches with each other. We laughed often, cried occasionally, and talked constantly! We never took for granted that luxury of time. The time it takes to grow a close friendship. We appreciated the rare and unique chemistry we shared. Our Monday morning beach walks started spontaneously with just the two of us and a pack of dogs. 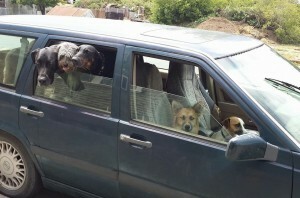 Shirley would pick me up in the “clown car” with 4 or 5 dogs and my 2 would jump right in, and off we’d go. On the way home, we would stop in Tomales at the deli and split a turkey sandwich, and bet each other we couldn’t get the sandwich guy to smile! (Now he has our sandwich waiting for us with a big smile on his face!) Shirley would post all her fabulous photos of our fun morning on fb, and soon other women began showing up and joining us on Monday mornings. Now our ritual has become somewhat famous with 20 dogs at times running and playing on the beach! It’s therapy for all and a great way to start the week! I was also honored to be in on the very first discussion of a possible non-profit. Now here we are…off on a glorious adventure! 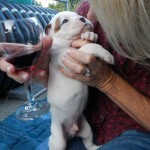 Shirley has already done so much for animals in need, now the sky is the limit! Shirley has a heart of gold, and I am so grateful to hold a place in that heart.